Boystown street parking will soon become even harder to find on weekends. And lots of locals say they love it. 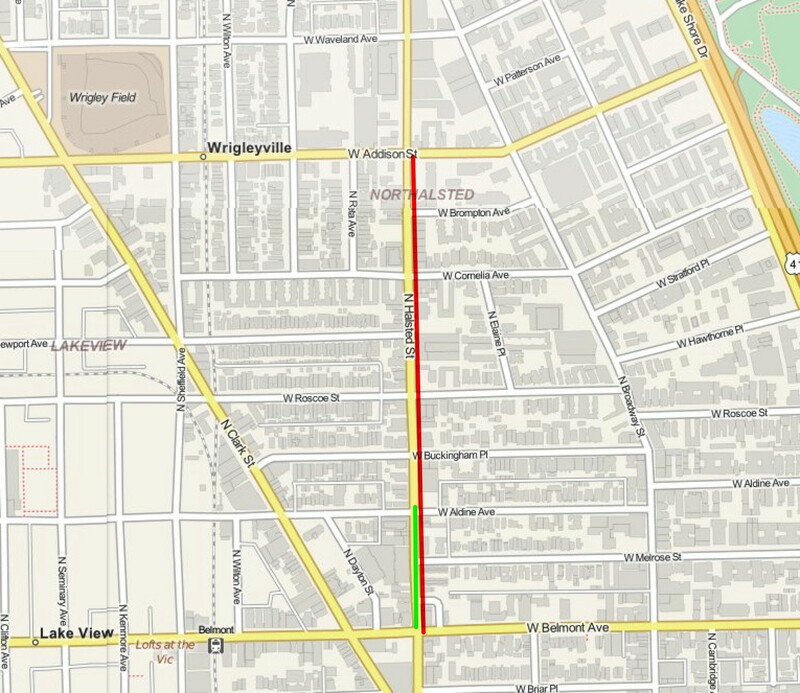 In two weeks, the city will test the expansion of a weekend no-parking zone that will outlaw street parking on a half-mile of Halsted Street from Belmont to Addison, according to comments made at a community policing meeting Wednesday and conveyed to CWBChicago by a reader. Police officials today confirmed the plan for this report. The current restricted parking area (green) will be stretched to Addison and hours of restriction will be extended. 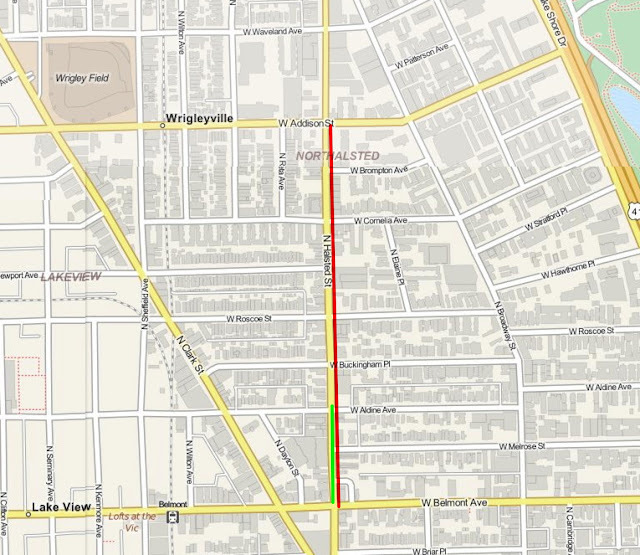 Parking on Halsted between Aldine and Belmont has been banned from midnight to 4 a.m. on Saturdays and Sundays between April 1 and September 30 for about three years. The zone was established to reduce “car parties” along the Boystown entertainment strip. The restrictions were put in place after residents—many living in a condo building in the 3200 block of North Halsted—complained about late night music blasting from parked cars, dancing on sidewalks, and drug dealing. 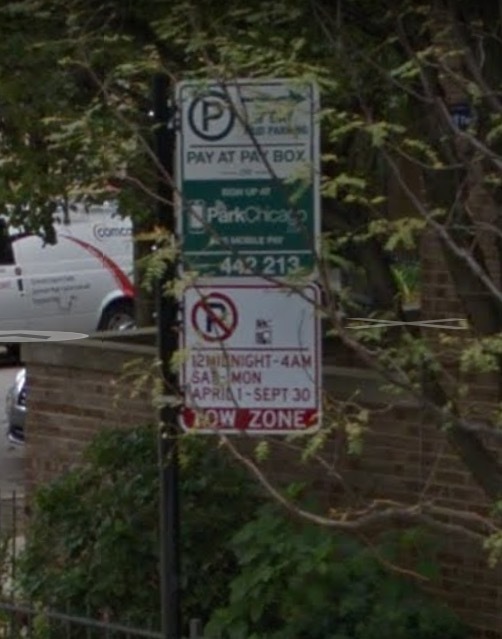 Last night, 44th Ward Alderman Tom Tunney said the established no parking zone “has been a success in the minds” of nearby residents and the 19th District has suggested expanding the restrictions all the way to Addison. A couple of things were not mentioned at the CAPS meeting: The newly-proposed restrictions will extend for two extra hours and will be enforced for an extra month each year. The new test program will kick in on August 18, barring parking on Halsted from Belmont to Addison between 11 p.m. and 5 a.m. Friday to Sunday, police spokesman Anthony Guglielmi said today. That would put the restrictions in place one hour earlier and keep them in place one hour later than the existing zone. And, the new restriction would be in effect until November 1—“the day after Halloween” one city official said—instead of September 30. No mention was made of the expanded time window and dates of enforcement at the CAPS meeting, an attendee said. The expanded restrictions will initially be announced through the posting of temporary “Police Order” signs along the affected area. A permanent change in the parking law via ordinance may follow. Buslik said Halsted Street businesses have been included in the decision. And neighbors in attendance were reportedly enthused by the idea. One suggested starting the program on that very night while another said a 9 p.m. start would be even better for them. Tunney said the 11 p.m. start was designed to minimize the impact on Boystown restaurants as well as to honor the city’s parking meter contract. We contacted Tunney’s office for comment about the plan. His office continued its 14-month practice of not responding to us.